Continuing with Paris Haute Couture Fall/Winter 2012 Fashion Week, designer Giambattista Valli showed his collection. Battista, known for his volants and prints, didn't disappoint on both counts. 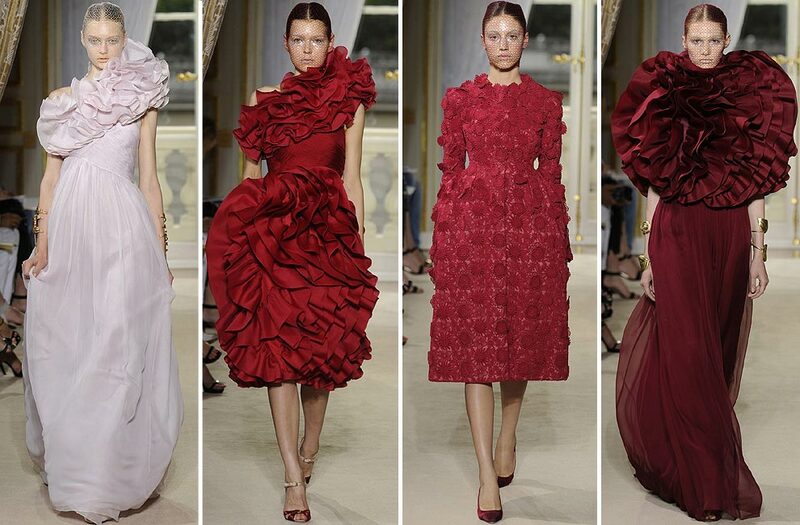 Ruffles exploded with grand exuberance in dresses, coats, gowns--you name it, they were there. 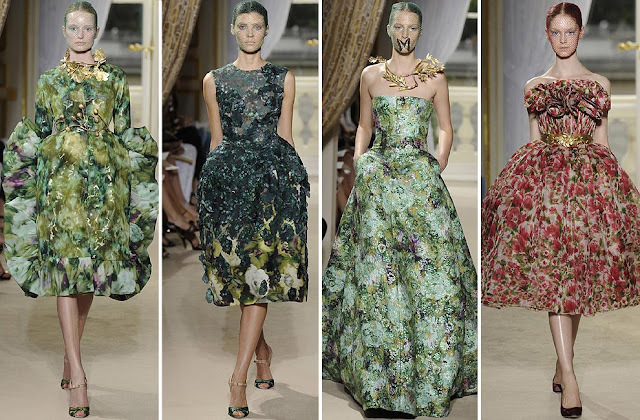 The collection--based on fairies, nymphs, and a whimsical garden of COUTURE, featured flower prints in every variation that it almost made me forget that this was a FALL/WINTER Collection--as opposed to Spring/Summer.This seems to be a trend for this season! You want PEPLUM? 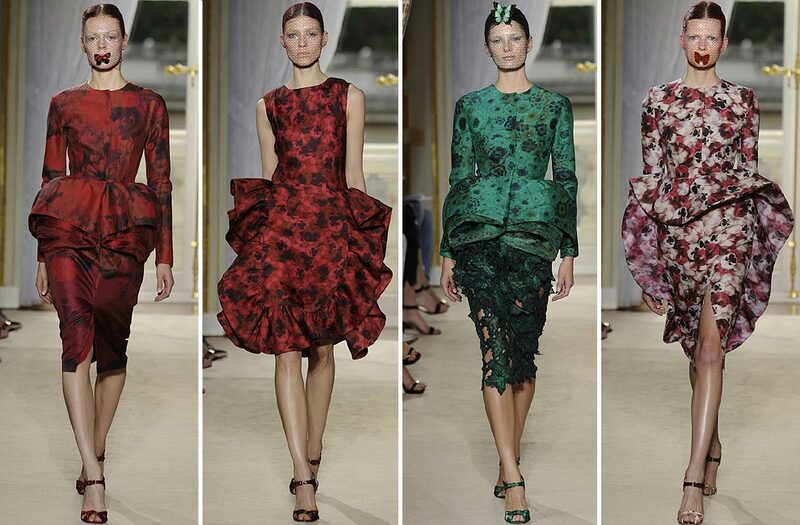 Huuuuney, Giambattista SERVED you PEPLUM--folded in what seemed like TEN layers(see far left and second-to-the-right photos above). Lord knows how those petite main COUTURE seamstresses fit all those layers into waist seams but they did it without a semblance of bulk (a masterful achievement indeed, trust me!). Many a cocktail dress and gown to satisfy all the multimillionaire ladies who order and buy these $100,000+ pieces, as well as those Cannes-and-Hollywood actresses who will borrow these dresses for a red carpet appearance worthy of all those flower prints and over-the-top ruffles. 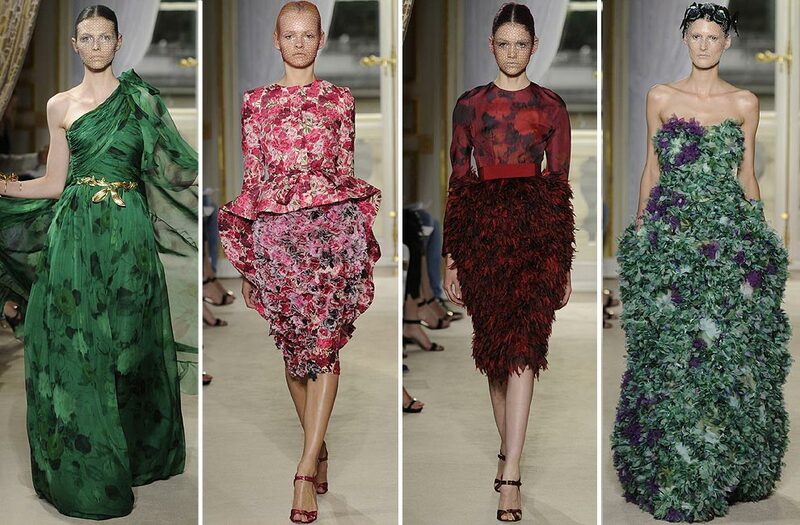 In my opinion, so far, this is one of my favorite collections of Paris Haute Couture Fall/Winter 2012 Fashion Week. Every piece was more incredible than the other. Each was a clear representation of what Haute Couture is and reminded me of those 1950's and 1960's heydays of Roman Alta Moda, which obviously influenced the designer a lot. I was literally SHAKING as I viewed every photo. I love it when fashion does that to me. Grazie mille Giambattista. 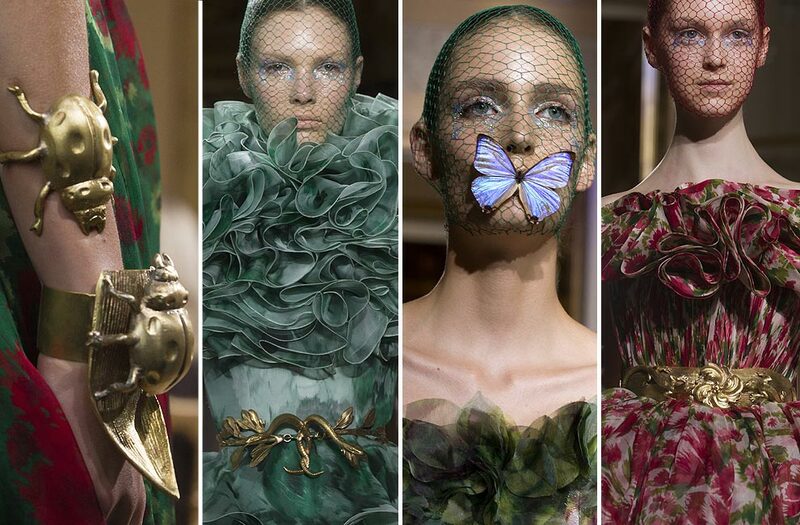 Flora and Fauna Details: Check out those netting masks covering the delicately beautiful model's faces--some highlighted with butterflies. The oversized lady bug arm cuffs and twig-like belts--all in gold were OUT of CONTROL! From head to toe, these were Grand Couture Nymph Fairies waiting for a fabulous party to attend! 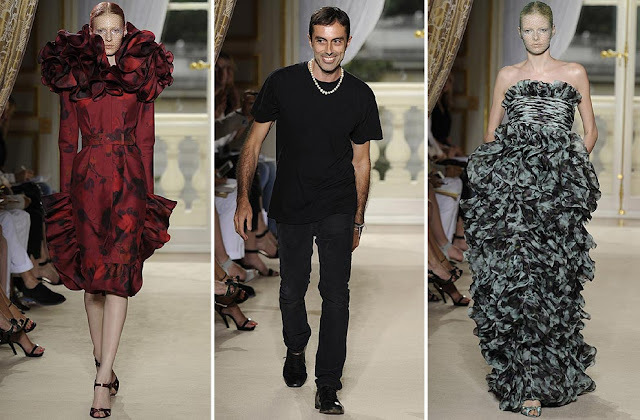 0 Response to "RUNWAY REPORT.....Paris Haute Couture Fashion Week: Giambattista Valli Couture A/W 2012"